When we hear the word tradition it brings to mind many things. Arguably, probably every one of us is touched by at least one tradition. Many are family oriented, such as how we celebrate a Holiday, the annual family reunion cookout, or how we are taught to treat others – these are all examples of traditions. In the fire service we have many traditions as well. From the first moment a new cadet (rookie or "probie") is taken into the department "family” they are introduced to fire service traditions. One of the most beloved symbols of the fire service is the Dalmatian dog. The origins of the breed are shrouded in mystery. Experts are unsure really how old the breed is. It is known that the Dalmatian, because of its poor hunting abilities, was relegated to the stable area of fine homes. It was in these stables that the Dalmatian became acquainted with the horses. Dalmatians were adopted by the fire service in the days of the horse-drawn fire wagons because they were agile and not afraid of the horses. The Dalmatian, with its superior agility and endurance could run out in front of the horses and clear the streets for the approaching fire wagon. There is no "set in stone" standard for the color of helmets. Until the 1980's it was common for firefighters to have black helmets. Only chiefs had a different color and that was white. Officers would have an emblem on their black helmets. New helmet design gives us a choice of colors. Captains often have red helmets and Chiefs are usually white. A national consensus is emerging but some departments apparently are clinging to their own traditions. A helmet is a very personal thing to a firefighter. Full-fledged firefighters are allowed to keep the helmet issued to them by the department upon retirement. Hudson Fire Department helmet colors generally indicate the following. White for Chief or Assistant Chief, Red for Captain, Black for Lieutenant, Yellow for Firefighter, Green for Safety Officer. We take great pride in the design of our department patch. 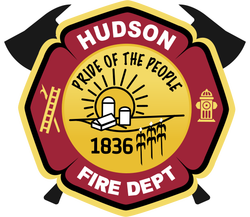 It was created as part of a school project and also serves as the Village of Hudson Logo. Each element of our patch has special meaning. HCFPD members wear this patch with honor. The patch symbolizes vigilance. The Maltese Cross represents charity, loyalty, gallantry, generosity to friend and foe, dexterity of service, and protection of the weak. It is also carried to honor those who carried the insignia before us. More information about the Maltese Cross can be found in the next section below. The shape of the patch is a shield which represents protection from danger. The shield's background is gold. This represents that firefighters must be of good character and temperate in habits. The gold symbolizes that firefighters, like gold, will withstand trial by fire and still remains. Thus, the shield is a symbol of protection, character, and strength. In the center of the cross is a traditional "scramble". It is a collection of items that represent readiness. The ladder and pike pole are tools of the trade. Combined, the fire hydrant, ladder and pike pole symbolizes total readiness. The color red behind the scramble symbolizes our enemy - fire - and represents the courage of men and women who battle one of the deadliest perils of mankind. It is the fire inside of each one of us that gives us the courage to battle the flames before us. The center seal of the patch has the date the Village was formed. It was named Hudson because many early settlers were from Hudson New York. T​he Maltese cross is known around the world as a symbol of the fire service. It is often seen painted on fire trucks, on the clothing of firefighters, depicted on firefighters badges, and is quite often the chosen design of firefighter tattoos. The Maltese cross has its origins going back to the era of the Crusades and is named after the island of Malta which came to be the home of the Knights of St. John. The Knights of St. John existed during the 11th and 12 centuries. To help identify friend from foe during the fighting, they needed a symbol that could be used to quickly and easily identify themselves. They chose the Cross of Calvary (which would later be known as the Maltese cross) as their symbol because the Crusades were battles fought for a holy cause. During these battles, the enemies of the knights commonly used fire as a weapon. It was not uncommon for a Knight to have to risk his own life to extinguish a fire or rescue a comrade. Because of their ability to fight fires, and the pride and honor they took in the care of their sick and injured, the Maltese cross evolved into a fitting symbol of the modern fire service. The cross has since come to represent the principles of charity, loyalty, gallantry, generosity to friend and foe, dexterity of service, and protection of the weak. Just as physicians have the caduceus, emergency medical service personnel have the Star of Life. The six-barred cross represents the six system functions of emergency medical services: Detection, Reporting, Response, On Scene Care, Care in Transit, and Transfer to Definitive Care.The snake and the staff in the center of the Star of Life portray the staff of Asclepius who, according to Greek mythology, was the son of Apollo, the god of light, truth, and prophecy. According to legend, Asclepius learned the art of healing from Cheron, the centaur. But Zeus, king of the gods, was fearful that, with Asclepius' knowledge, men might be rendered immortal. Rather than have this occur, Zeus killed Asclepius with a thunderbolt. Asclepius was worshiped as a god and people slept in his temples, as it was rumored that, in death, he effected cures of prescribed remedies to the sick during their dreams. Asclepius is usually shown in a standing position, dressed in a long cloak, holding a staff with a serpent coiled around it. The staff has come to represent medicine's most recognized symbol. In the caduceus, used by physicians, the staff is winged, with two serpents intertwined. Although it holds no known medical relevance, it represents the magic wand of the Greek deity, Hermes, messenger of the gods. The man who established the first volunteer fire department also invented bifocals, wrote and printed Poor Richard’s Almanac, studied electricity and helped draft the Declaration of Independence. His name was Benjamin Franklin. The first volunteer fire department began in Philadelphia in 1736. Franklin often wrote about the dangers of fire and the need for organized fire protection. He was dissatisfied with Boston’s Mutual Fire Societies (also known as "Fire Clubs") because the "Fire Clubs" existed solely for the protection of its members, not the community at large. Franklin wanted organizations that would battle all fires, regardless of whose property was burning. After an extensive fire in Philadelphia in 1736, Franklin established the first all-volunteer fire brigade which was known as The Union Fire company which was comprised of 30 volunteers. As the idea of volunteer fire brigades gained popularity, additional companies were formed in Philadelphia. Each of the companies paid for their own equipment and located it throughout town at strategic places. Other famous Americans who served as volunteer firefighters include: George Washington, Thomas Jefferson, Samuel Adams, John Hancock, Paul Revere, Alexander Hamilton, John Jay, John Barry, Aaron Burr, Benedict Arnold, James Buchanan and Millard Fillmore. Give me strength to save some life, whatever be its age. Or save an older person from the horror of that fate. And quickly and efficiently to put the fire out. To guard my every neighbor and protect their property. Please bless with your protecting hand my children and my wife.